Civil Dusk, JIMMY BAKER’s second solo exhibition at Foxy Production, introduces a new series of intense and moody oil and resin paintings. 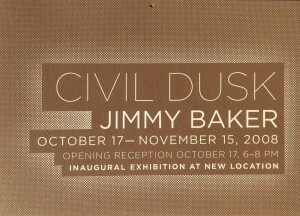 In Civil Dusk – the period after the sun has edged below the horizon and objects are still distinguishable – Baker uses cloaks of fog, smoke, or dust, and disorienting inversions and combinations to make the known feel uncanny. Baker explores American landscape painting’s myths of expansion and freedom, and its conjuring of sentiment and the sublime. He relates its strategies to those of the contemporary media, refracting scenes gleaned from television and the Internet through the lens of Romanticism. His new paintings exhibit a dramatic high gloss sheen that is at once seductive and distancing: they act as both screens and mirrors. As if situated within the eye of a storm, Baker’s paintings bear a calm surface that is underscored by a sense of impending turmoil. The work Passing presents a vista of lake, mountain and sky that could be found as easily in the American West as the troubled ranges of Afghanistan; in View from CCTV, a vast mountain-scape is seen through the windows of what may be a military observation tower; and in Iron Mountain, the huge underground storage facility is depicted in deep reds and grays, eliciting senses of both safety and fear. Baker dramatizes the boundaries of representation, depicting unbounded visions tempered by a consciousness of spatial, existential and social limitation. Moving across continents and through clouds, Baker’s perspectives blur definitions and ready identifications: a star atop a Stalinist tower’s spire appears to float off into a turbulent foggy Moscow sky; a fiery, riotous Guy Fawkes celebration is captured in a dramatic palette of red, yellow and black; and a Middle Eastern palace appears through a miasma of dust. Baker creates a filter between viewer and scene that both romanticizes and disengages its subject, producing a profound sense of displacement. The works in Civil Dusk picture the impossible in the most credible ways. With bravura they play with the conventions of visual artifice in painting: above an expanse of blackness, lights reflect upon still water and night falls upon a mountain range; and a nighttime air attack appears inverted, above an outcrop in a wintry alpine terrain. Baker’s paintings beguile with their suspension of the laws of perspective and gravity, seducing the viewer while laying bare the devices of traditional landscape painting.